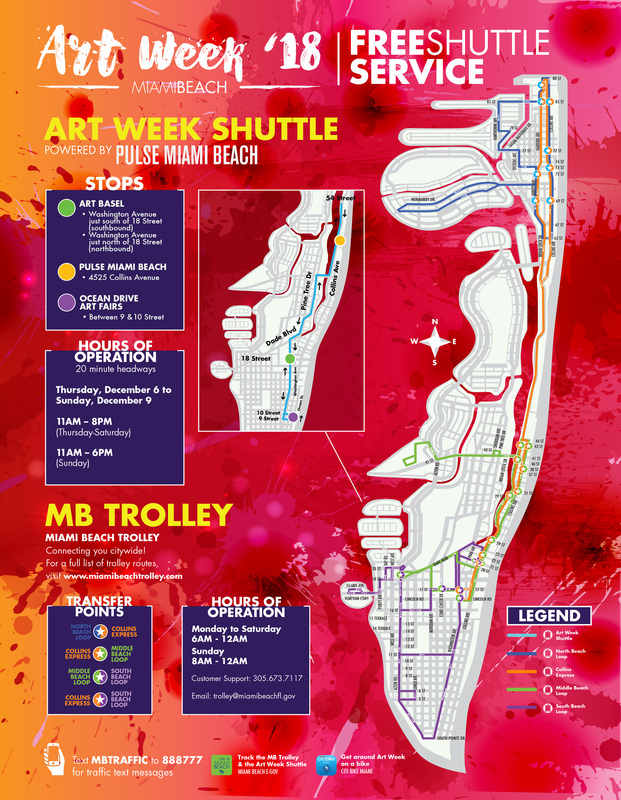 Experience the splendor of Art Week with ease as you ride in style via our Miami Beach citywide trolleys or the Art Week shuttle service, powered by PULSE Miami Beach. These two free transit options are the perfect way to visit the art fairs and special events located throughout the urban island. The Miami Beach trolleys will run on their regular schedule operating Monday to Saturday from 6 a.m. to midnight and Sundays 8 a.m. to midnight. The Art Week Shuttle Service will run Thursday, December 6 to Saturday, December 8 from 11 a.m. to 8 p.m. and Sunday, December 9 from 11 a.m. to 6 p.m. at a frequency of approximately 20 minutes.